C.O.R.E. (Content Optimization and Relevance Engine) is a suite of technologies developed by Yahoo! Labs to surface the stories most interesting to you, based on your reading behavior over time. Every hour C.O.R.E. processes 1.2 terrabytes of data in order to learn how a user’s behaviors and interests influence the likelihood of clicking on a specific article. And, every day, C.O.R.E. 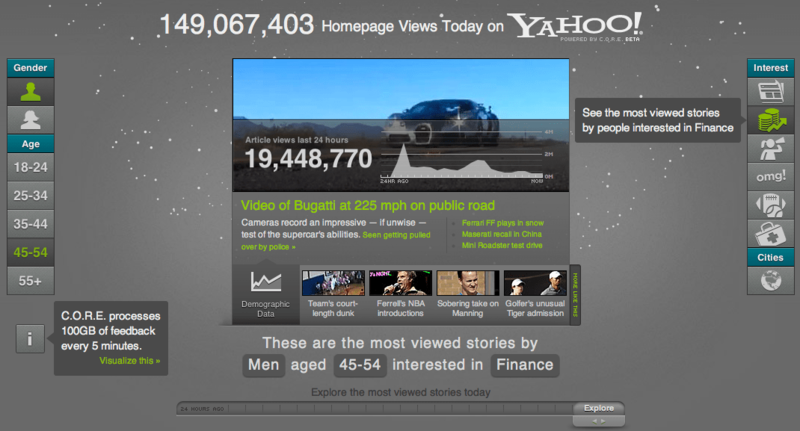 personalizes 2.2 billion pieces of content for Yahoo! users. Since optimizing with C.O.R.E., Yahoo!’s Homepage click-through rate has increased 300%. Yahoo!’s personalization approach is a clever mix of scientific algorithms and human judgment, as editors have control to override C.O.R.E. at any time, to ensure certain stories are seen. Initially developed within Yahoo! Labs, C.O.R.E. has become a vital tool used throughout the day by editors across the company to bring our users personalized news, first. The visualization lets you see stories through filters of gender, age, and interest. The image above, for example, shows a male in may age range interested in business and finance. Well worth playing around with, and a very good example of what I call “dependent web” content. More information on Yahoo’s blog here. It’s odd not to find a single finance-related story in either your screenshot or the current view for finance-related news. Sorta. I guess finance guys like cars. Previous Previous post: Larry Page’s “Tidal Wave Moment”? Next Next post: Thinking Out Loud About Voice Search: What’s the Business Model?